Here's a sneak peak of a photo shoot for a recent DIY collaboration. Valentine's Day is such a fun day because you are allowed to feast on chocolate and everything special. Cupcake fondue and peanut butter ladyfingers... #YUM! DIY Alert: If you're crafty, it's great to make table accents for parties or just around the house or office! 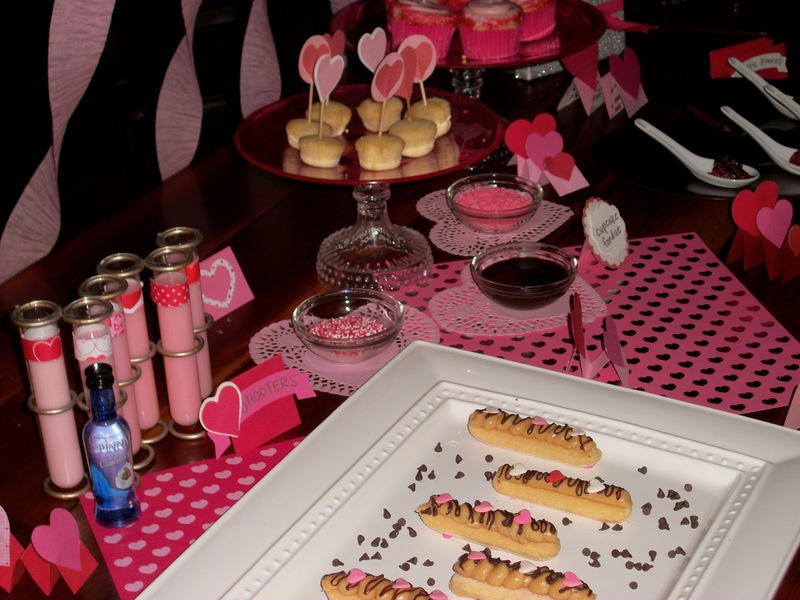 Accordion paper hearts and cupcake toothpick toppers are a lovely addition to your spread! "If your husband's boss or some other special guest is coming to dinner on a week-day evening and you want to do something extra for him which doesn't appear on the menu for the day, perhaps you can switch it with Sunday's dinner. This usually provides for something a little 'special' and may just fill the bill." It's peanut butter and jelly (cupcake) time! Who needs a sandwich when you can have a peanut butter and jelly cupcake?! They sure know how to make them at Muscoreil's Fine Italian Desserts! We had such a blast on Winging It! Buffalo-Style! celebrating National Peanut Butter Day! Check out the recipes for what we made on set! Try these recipes out in honor of one of our favorite National Holidays! Chocolate is optional with this delicious peanut butter appetizer perfect for National Peanut Butter Day! 1. Preheat oven at 425 degrees. 2. Brush crust less bread with peanut butter, cut into quarters. 3. Place on non-stick baking sheet. This is a dessert that is perfect for your Valentine and/or that special one in your life that loves the combination of chocolate and peanut butter. Super easy, all you really need is chocolate cupcakes and peanut butter mousse. BEHIND THE APRON TIP: Chocolate ganache (chocolate chips + heavy cream) is a delicious addition to give it an even more gourmet touch! Tuesday is National Peanut Butter Day. What better reason to make this easy and delicious snack?! It's perfect to start your day with at breakfast, but you will find yourself noshing on it all throughout the day! 1. Heat sugar and honey in a saucepan over medium heat until sugar is dissolved. 2. Add peanut butter until smooth. 3. Spread over cereal atop a Silpat lined baking sheet or buttered baking pan. 4. Spread the mixture into a rectangle of desired thickness. Cut when completely cool. BEHIND THE APRON TIP: You may find that it's easiest if you use a rolling pin to help spread out the cereal/pb mixture. Loving these adorable Valentine's Day inspired cupcake toppers! They are easy to make yourself. Just follow the simple steps after the break! Celebrity Post: Pre-Valentine's Day Edition! Loving the use of x's & o's and conversation hearts! Keep sending us your cupcake pictures! DIY Edible Valentines: Have fun and frost some cupcakes! It's a great feeling watching people dive in and eat cupcakes that you've taken time to create. It's also a great feeling watching people enjoy themselves doing something new, festive and fun. That is why it is so fun to have a "Cupcake 101" class! Whether you consider yourself a novice or an expert, gather your friends, some edible accoutrements and have a cupcake decorating party. You will absolutely have a good time! Make cupcakes for your Valentine! Swap this delicious buttercream recipe for the store-bought on your next batch and prepare yourself for kisses of thanks! BEHIND THE APRON TIP: The key to successful buttercream is equal parts fat and sugar. Now, what does that mean? If you are using one pound (one pound box of unsalted butter = 4 sticks), use one pound of confectioner's sugar. If doubling, for 2 dozen standard cupcakes, use one 2 pound bag of confectioner's sugar and two boxes of butter from the supermarket. Yes, Valentine's Day is normally full of chocolates and flowers. However, a real treat is a french macaron. Take a look at this beauty! Add the fact that it's shaped as a heart makes our hearts full of happiness! These are the days of great debate. The holidays have come and gone, and we are now choosing our sweets a little more carefully. After all, post-holiday calories do count! But with Valentine's Day quickly approaching, we must make known our favorite flavors to our suitors and loved ones, to assure a truly satisfying calorie-fest. 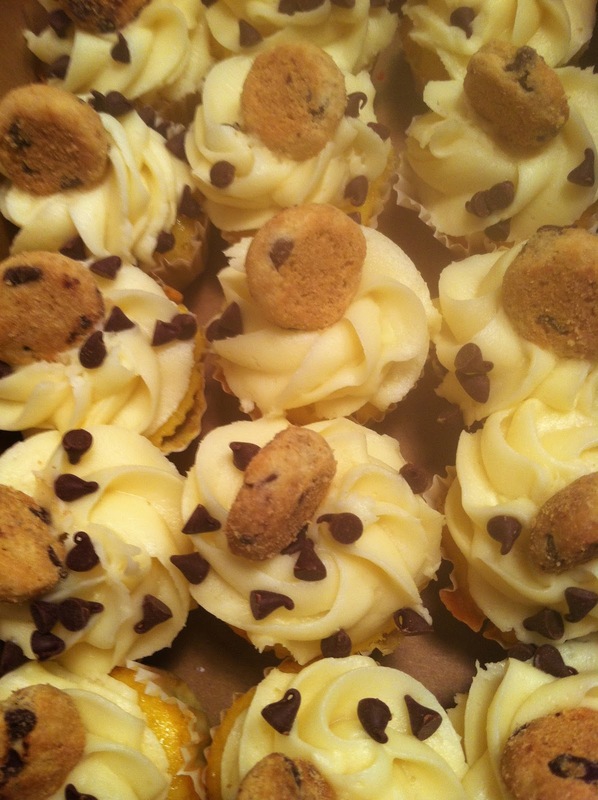 Chocolate Chip Cookie Dough Cupcakes: Step-by-Step! 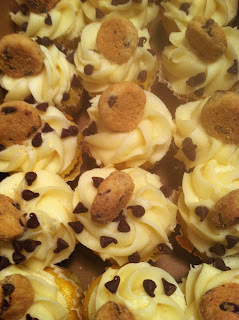 Voila: Chocolate chip cookie dough cupcakes! When brainstorming a new cupcake, there are different elements to consider. Size, cake, and frosting. Here's a step-by-step tutorial to the most delicious mini chocolate chip cookie dough cupcakes to pass your lips! 1st: Size. Almost always the best choice is mini cupcakes. They feed more people and they are more fun to pop! 2nd: Cake. When choosing the cake, use your imagination! Mini chocolate chips in a basic yellow cake recipe is a delicious way to change the ol' classic. And the best part about it is that the chocolate chips remain somewhat in tact after baking, making it a complete mix of chocolate chip cookie and cupcake. 3rd: Frosting. A no-brainer. Team Lola Pearl is so in love with cream cheese frosting that we dream of it dripped in ganache. However, to make it truly chocolate chip cookie dough frosting, there is one key ingredient that must be added: brown sugar. Depending on your frosting, start with one tablespoon and flavor to taste! Sprinkling the mini chocolate chips on top of the frosting and finishing with a mini cookie is the only way to finish this delicious concoction! 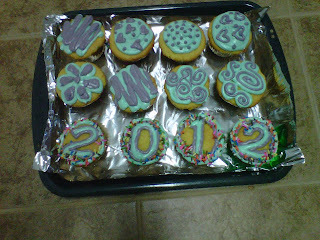 Our favorite cupcakes of 2011! We saw a lot of amazing cupcakes in 2011. However, the most adorable and most shared cupcakes are BY FAR these super cute dragon cupcakes by Pastry Chef Elizabeth Dale at Muscoreil's Fine Italian Desserts! When the temperature drops into the single digits, there is no better time for homemade soup. Combine these herbs and enjoy a fabulous melange of flavor of the French countryside. You can also use the combination when making a rice or chicken dish. Rice Crispie Treats + 2012 = Creative + Cute! 1st birthday cakes are exceptionally fun because babies are too young to have a theme that they insist on (like trains or princesses), so decorating can go in any direction. Team LP believes in the power of pink buttercream, glitter, and buttercream flowers/polka dots... Which is why this cake is right up our alley! Celebrity Post: New Year's Eve Cupcakes! Who wouldn't want to ring in the new year with these whimsical cupcakes?! Delicious coconut cupcakes with cream cheese frosting! Great job, Barb!! Wow! 2012! Whether you celebrated in sequins or in pajamas, cheers to an amazing new year! 2011 was blessed with wonderful opportunities and great friends. It's exciting to see what's to come! Resolutions: Drink less coffee, laugh more, and concentrate on what makes YOU happy.